Whilst the US teeters on the edge of recession and the UK battles with its own economic problems, it's easy to forget that some areas of the world are booming. Welcome to Brazil. The boom is silencing critics who - ever since the term Bric was coined by the investment bank Goldman Sachs to explain the key emerging economies of the world - have been questioning Brazil's inclusion. "Unequivocally, yes," insists investment banker Jean Marc Etlin, vice-chairman of Banco Itau BBA. "Brazil is a Bric" - alongside the other three; Russia, India and China. "It's a junior Bric, but going up the ranks. "It certainly fits the bill with healthy growth, a high population and plentiful natural resources." Brazil's growth rate remain relatively low compared with other Bric's though. Its gross domestic product, or GDP, is rising at 5.4% per year, compared with 8.9% in India and 11.5% in China. This is why sceptics used to believe that Brazil's inclusion is absurd, though many have changed their minds. "I'm no longer a sceptic," says Zeina Latif, head of economics for ABN AMRO in Brazil, citing the recent strength of Brazil's exchange rate and its macro-economic conditions. When it comes to resources, Brazil has plenty. Agriculture has been growing at 13% a year, largely thanks to China's huge appetite for soya and beef products. Land the size of England is being given over to the sugar cane, which is used to produce Brazil's enormous ethanol supply. And the country is the world's largest exporter of orange juice. 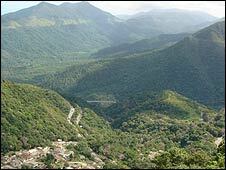 Brazil's recently discovered oil reserves are set to turn the country into a net exporter. The boom in commodities and credit has played a part in fuelling the rise of Bovespa, the Brazilian stock market. "The market capitalisation is $1.4 trillion (£700bn)," says Joao Batista Fraga at the stock exchange. "In the last 10 years it has increased nine fold." But it is the structural changes in the economy that are creating the most excitement. In the days of hyper-inflation, everyone spent their money the moment it was paid and no one was willing to lend. All property had to be bought with cash. Now that stability has returned to the economy, the sector that is causing so many problems in the US and UK - consumer credit and mortgages - is beginning to create real opportunities in Brazil. In shops, credit is just emerging, albeit at horrendous rates: 70% is not an unusual figure, and mortgages are also becoming available. Little surprise, then, that property prices are booming, both in the domestic and commercial sectors. 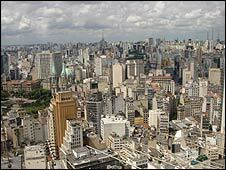 In Sao Paulo, for example, office rents have tripled in three years. The growing wealth can be sensed in the elegant shops. In downtown Sao Paulo there is no shortage of money to spend and the beautiful people are not coy about spending it. Some 60,000 new dollar-millionaires emerged in 2007 and it is said that many of the luxury brands have their highest global sales per square metre in Sao Paulo. Despite the boom, Brazil's economic rise is not entirely smooth. Red tapes drives businessmen to despair, there are 75 taxes companies may be called upon to pay, and income inequality is rife. 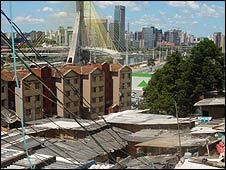 Around the corner from many parts of the affluent city there are the favelas - effectively slums, though the word itself refers to a tenacious plant that grows on hills and is virtually impossible to eradicate. In reality, the favelas are indeed usually on steep land that no one else want, where people live in tiny corrugated iron shacks. If it weren't for the stifling heat you would think you were in Dickens's London. Life is nasty, brutish and short. 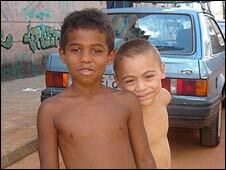 Tiago has lived in the favela all his life. He is doing a course across the river, on the rich side. In economic terms, it may as well be the other side of the world. "Newspapers say life is better for Brazilians but that's not accurate," he says. "In Sao Paulo there's a huge contrast between rich and poor. "There are always luxury apartments being built next to the favela, so the world thinks it's getting better. But here in the favela it's not improving." Brazil's cumbersome tax system does not help. Including indirect taxes, the poor end up paying proportionately far more in Brazil's topsy turvey system. People who earn up to three times the minimum wage pay 48% tax. Wealthier people who earn 30 times the minimum wage pay 24%. As yet, the money has not trickled down sufficiently to the lowest in society, but the wealth is certainly being created. Many within the authorities are keen to have Brazilians participate more broadly in the success of the economy. For example, at the stock exchange they welcome 16,000 young visitors a year to explain to them how to buy stocks and shares to become a part of this brave new world. The students seem receptive, even entranced by the drama of a buy-sell re-enactment on the stock exchange floor. Brazil clearly has a long way to go before income equality reaches acceptable levels. But with its commodities, its fledgling property boom and its taming of past inflationary fears, it is well along the path to becoming a developed economy.